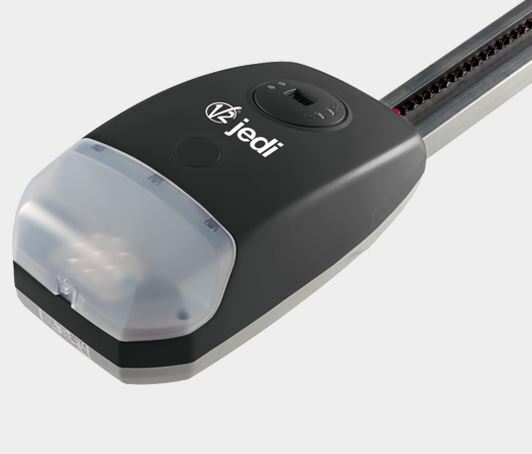 If you are like most people and would like to have an easier way to open your garage door, then you will love our excellent garage door opener. It will makes things a lot simpler for you, and you'll be able to stay warm inside your car whilst you drive right on in! Our garage door openers are a time-saver and made to last. JEDI is an Electromechanical irreversible motor for sectional and spring balanced doors up to 2.25 m in height and counterweight balanced doors up to 2.45 m in height. Max area ( 10 m²) Maximum force 700 N (70 kg).The kit contains:- 1 x AZIMUT Electromechanical actuator, 2 x Phoenix 433.92 MHz two-channel transmitters, 1 x one piece chain guide (Length = 3 m).